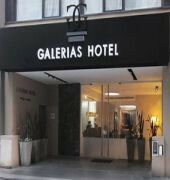 Galerias Hotel's restaurant serves breakfast, lunch, and dinner. 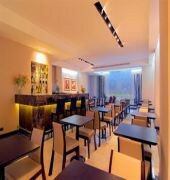 The hotel also has a snack bar/deli and a coffee shop/cafe. A bar/lounge is open for drinks. Room service is available. The hotel serves a complimentary breakfast in the breakfast area. Recreational amenities include a health club, a sauna, and a fitness facility. 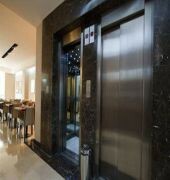 This 4 star property has a business center and offers a meeting/conference room. Complimentary wireless Internet access is available in public areas. This Buenos Aires property has event space consisting of banquet facilities and exhibit space. For a surcharge, shuttle services include a roundtrip airport shuttle (available on request), an area shuttle, a theme park shuttle, and a cruise ship terminal shuttle. Concierge services, tour/ticket assistance, and tour assistance are available. 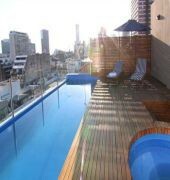 Other property amenities at this Art Deco property include a rooftop terrace, multilingual staff, and currency exchange. The property has designated areas for smoking.43 air conditioned guestrooms at Galerias Hotel feature iPod docking stations and minibars. Accommodations offer city views. Beds come with down blankets and premium bedding. Bathrooms feature separate bathtubs and showers with jetted bathtubs and rainfall showerheads. They also offer bidets, complimentary toiletries, and hair dryers. Wireless Internet access is complimentary. In addition to desks and laptop compatible safes, guestrooms offer phones. 32 inch LCD televisions have cable channels and free movie channels. Also included are safes and windows that open. A turndown service is available nightly, housekeeping is offered daily, and guests may request wake up calls.